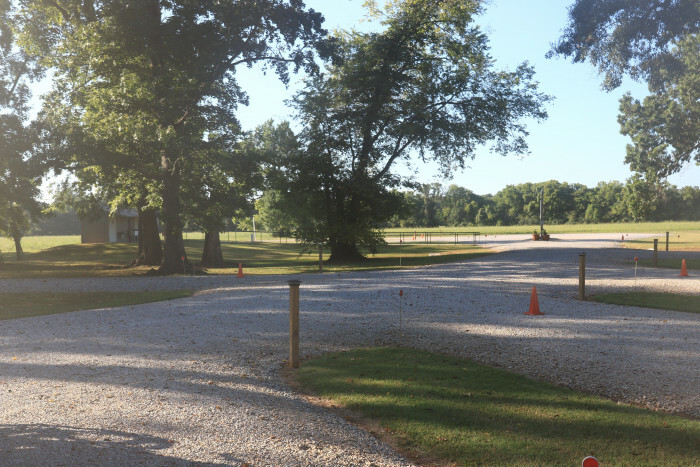 Ask fellow campers about "Alexandria RV Park" and nearby attractions. First Impression: Very small - 10 sites. Well groomed. Appealing. Safety: No concerns. Access: I-49, Exit 94, south a block to LA-1, then east about 2 miles, LA-1 in good condition, sign is parallel to the road so you don't see it until it's "right there", not in Garmin GPS database. Office: Owner/manager is very nice and accommodating. No office, call and she'll come to you. No store. Credit cards accepted. Online reservations not available. No price discounts. Facilities: No pool, spa, fitness room or rec center. No laundry room. Men's restroom/shower clean; women's needs help; one person at a time. We inspected but did not use (score "B"). No propane sales. No playground. No off-leash dog run. Campground: Not in a flood plain. Restrooms are a storm shelter. Heavily wooded all sites (except 5 and 6) with tall, mature trees. Interior roads are not too narrow, gravel in good condition with gentle turns and no overhead obstacles. Big rig friendly but Prevosts might have maneuvering problems. No tent area, yurts, or cabins. 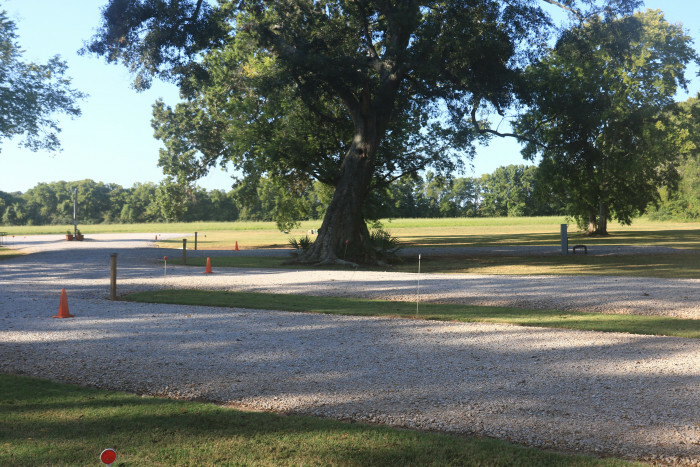 Sites are all spacious, level, large gravel, all back-in, grass between. Water and electric at middle of site with 20/30/50; no meters. Sewer is at extreme rear of pad, long rigs might need multiple stinky-tubes. Good water pressure with good taste. Sewer pipe is 4" threaded, about 3" above ground level. No patios. No picnic tables. Fires not permitted; no fire rings. Poor satellite views except sites 5 & 6. No cable TV. Free Wi-Fi with good coverage and bandwidth. Verizon phone at 3 bars; 4G at 1 bar. No recycle bins. Noise: No railroad or interstate noise. Regional airport nearby. Some local traffic notable. Bug Report (mid March): gnats. Runners: CG roads too rough for running. Yoga: grassy areas suitable for your mat. Conclusion: Score 7-Good. We will return if in the area. 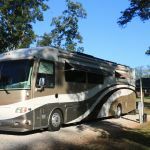 We camped at Alexandria RV Park in a Fifth Wheel. Alexandria, Louisiana, about 6 miles south with everything you'll need. Multiple RV dealers/stores, restaurants (IHOP, Outback, etc), fast food, banks, hardware stores, Autozone, O'Reilly's, etc. Most everything is off US-71 South from I-49. Rate reflects a week stay plus an extra day. Sites are all gravel, elevated to keep dry after rains. The grass is well mowed to hold down the mosquitoes. The owners are very diligent about upkeep and try to contain the fire ants, but do be very careful at night if walking the dog. If you look at a satellite view, you will note that the park is near AEX runway, though we were not disturbed by planes-just a few flights but not objectionable. There is a train track in the distance and you might hear it sometimes - again, not objectionable. We stayed at the park for a family visit, so most of our daytime activities were outside the park. On the couple of days that we stayed at the park, it was quiet. There are no frills, and we were not looking for a traditional park - just a place to sleep and park for a week. That's the only reason I would grade it slightly lower because it's not a park for travelers with children who might want a playground. It met OUR needs perfectly and we will return. We didn't have good Verizon data service (3G) although voice was acceptable. On the last day, the service was bouncing between 4G and 3G and was constantly dropping... just on the edge of the LTE service range, I guess. Power was good, perhaps on the edge of high at 126V at times. Water was WONDERFUL soft water that central LA has - we made sure to fill the fresh water tank before we left. Do reduce the amount of soap when washing your clothes. Septic might require an extension - we backed up to be sure we were not under one of the large mature tree limbs so we had no issue reaching the sewer. Takes some creativity on your portable satellite dishes - we use an optical satellite alignment tool and we "just made it" in a small gap in the trees. Not the park to "guess" where to put your dish. We camped at Alexandria RV Park in a Motorhome. Very clean and quiet. Nice level and long sites. Owners very friendly and helpful. Convenient to town. Would definitely stay again. We camped at Alexandria RV Park in a Travel Trailer. Overall very clean and very well satisfied with owners. I do recommend if traveling with dogs, to call first and tell them what breed and recommend a meet with the owners and your pet. Also state if you have a official service animal (license and approved and not a piece of online paper). I was very surprised, they have over 6 breeds on there no dog list, even huskies. So please call ahead for dog introduction. We camped at Alexandria RV Park in a Motorhome. This park was very much a surprise. We pulled in and the owners came to us in a golf cart to check us in. We were one of two motorhomes there. You are surrounded by hayfields. No store or anything, however the peacefulness and quietness of the area was magnificent. Great One night stop over. We camped at Alexandria RV Park in a Motorhome. Small but very good RV park. Great for over night, or if staying a while in Alexandria, LA if you just want a place to stay. Pretty much what everyone else has stated: nice spacious sites some in shade, some not; gravel but nice, deep, solid gravel, not just a few handfuls thrown on the dirt; small facilities (single showers and necessaries per gender) but clean. Nice couple who have turned a piece of pasture into a going concern. Would certainly stay again if going this way. We camped at Alexandria RV Park in a Motorhome. Close to everything in Alexandria. Very clean park in a very nice setting. Quiet. Owners were very friendly. Long back in sites and level. Gravel. Rural setting but close to town. We camped at Alexandria RV Park in a Motorhome. A delightful little campground, immaculate restrooms, friendly owners. A definite stop next time we are in the area. We camped at Alexandria RV Park in a Motorhome. Paid for full amenities. 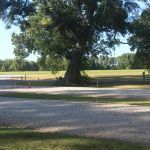 The park location was great, fields of rolled hay, only 5 miles to our destination CenLa Rv center for warranty work. The restroom was closed for vandalism so we don't even know if they had a shower. The wifi (free) didn't work they said probably bad weather in vicinity but it only rained. The location was beautiful but cost should have reflected the lack of amenities. The host were young and only 3 years of ownership but very friendly. We camped at Alexandria RV Park in a Motorhome. This is a great park. It is very quiet and peaceful. The sites are long enough for big rigs and plenty of space between each site. Individual restroom/showers are adequate and clean. I would give this park a 10 if it had more amenities but for what it has it is a 10. Since opening in September of 2012 the owners are working hard to improve and maintain the park. The office is in a mobile home adjacent to the park. We camped here for a week. We would definitely come back again. We camped at Alexandria RV Park in a Motorhome. 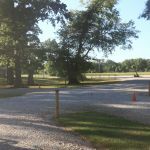 A great RV park in the middle of a wonderful area. This park is brand new (maybe a year old). Owners are very nice young couple. The park is next to a huge green field with lots of birds. Very nice and peaceful setting. Pads are level crushed gravel. Restrooms are very clean. We were here 1 week, and will most definitely stay here again. 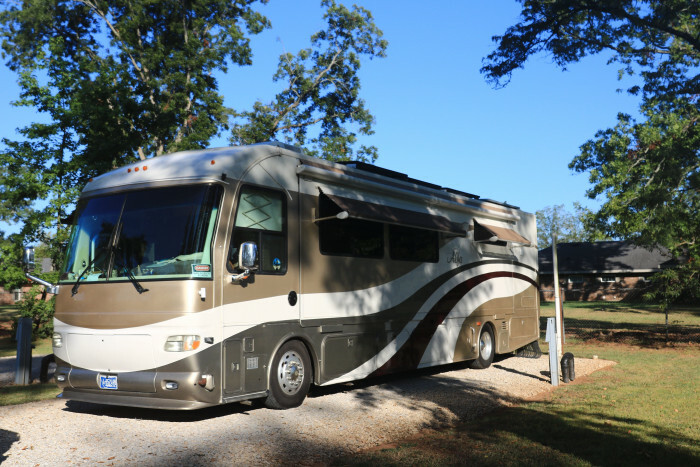 We camped at Alexandria RV Park in a Fifth Wheel. Are you affiliated with Alexandria RV Park ?